A Deolali (Devlali) near Nashik is a peaceful place away from the daily rush. It is a perfect weekend destination to revitalize yourself with pollution free air in the well-maintained cantonment area. Deolali camp attracts a large number of pilgrims and history lovers throughout the year. Nowadays everyone has lost the connectivity with the natural environment, which is the biggest loss to the people especially those staying in metro cities. Hence weekend home is one of the alternates for the quick rejuvenation. 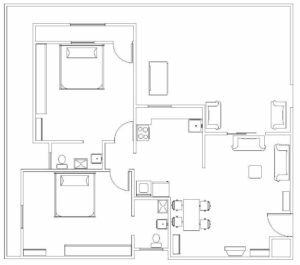 A Mumbai based businessman has invested in an apartment located at Deolali (Nashik) & approached us through his design architect to provide vastu inputs for the same. Basically, it was a holiday home or we can say a weekend home. Weekends are a good time for family togetherness. A project with multiple facilities like temple, gymnasium, swimming pool, garden, and restaurant has created a great demand for the project in Nashik. Since the apartment was already built, the scope for the vastu planning was very limited. The apartment has an extension towards the northeast which is positive as per vastu. Due to this, it brings good spiritual vibes amongst the family. House has a toilet towards the north, a zone of wealth. As a result, it may result in more traveling expenses. Kitchen towards the east has to be planned internally according to vastu. Let us get one major Vastu myth out of the way. In the majority of the existing houses or pre-build places, there is no need for major demolition or reconstruction for vastu corrections. The beauty of Vastu is that you can gain vastu benefits by incorporating simple but effective changes, which will make major changes in your life. Vastu is not a religion; it is a pure science of vibrations for setting things correctly and balancing the five vastu elements i.e. earth, fire, water, space, and air. The door has been made to open in a clockwise manner. Prayer area( Puja Room) has been suggested on the east wall leaving a toilet sharing area. So tranquility area does not have polluting energy. A. Vastu Zone- Enhance fire with red triangular coral at 135 compass degree. B. Vastu Zone- Energize center with vastu crystal grid under the flooring of the central zone of the entire house. C. Vastu Zone- Correct south-west by installing lead metal block along with the Audumber tree in the compound area. D. Vastu Zone- Surcharge north East with pears placed in marble pot (cool zone). E. Vastu Zone- Enhance north West with the aromatic plants (wind area) along with Lapiz crystals.